This process is concerned with the procurement of an EA modelling tool. It should be noted that any information within the Enterprise is not an island and therefore (as POET prescribes) due consideration must be given to how the EA tool fits in with the landscape of other tools utilised by the Enterprise (e.g. Portfolio Planning and Management, Risk Management, Configuration Management and Change Management, etc). ¨ Determine how this new Tool will fit into the wider Transformation Tool family. ¨ Using PEAF, create a list of all EA Tool Vendors to be considered. ¨ Using PEAF, create a set of EA Tool Requirements. ¨ Send RFI to Tool Vendors. ¨ Evaluate responses and shortlist 5-6 Tool Vendors. ¨ Organise and Attend Tool demonstrations. ¨ Evaluate demonstrations and select a “Final 3”. ¨ Send out RFP and arrange Proof of Concepts. ¨ Evaluate responses, perform commercial negotiations and select Vendor. ¨ Plan the training, buy the licenses and order the hardware. 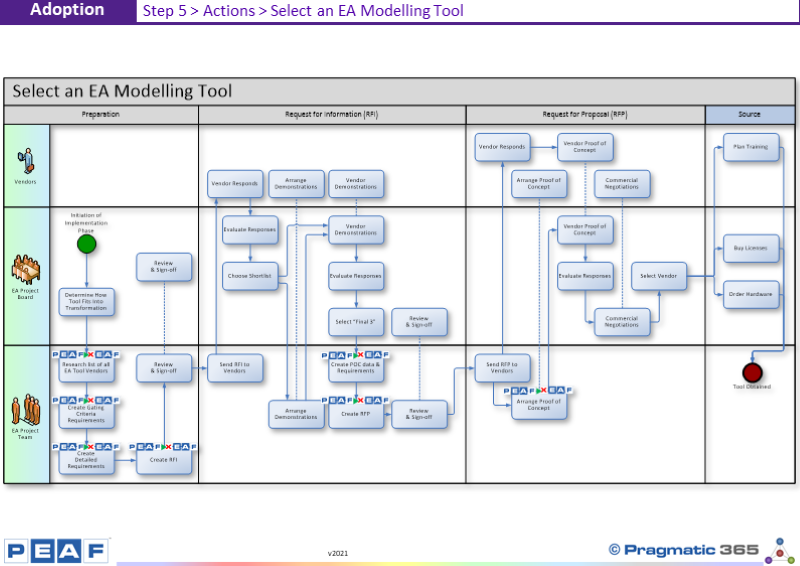 Does this process match your Enterprises process for Selecting and EA Modelling Tool? If not, is their anything missing? How would you define this process?